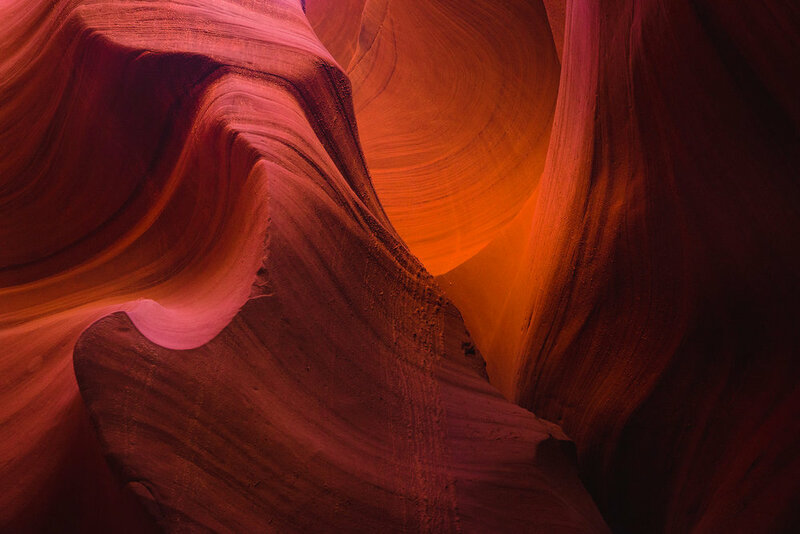 Antelope Canyon. A location on many photographers’ bucket lists, so I couldn’t let a trip through Page, AZ (check out the other photos from Arizona here) go by without a visit to the renowned Antelope Canyon. 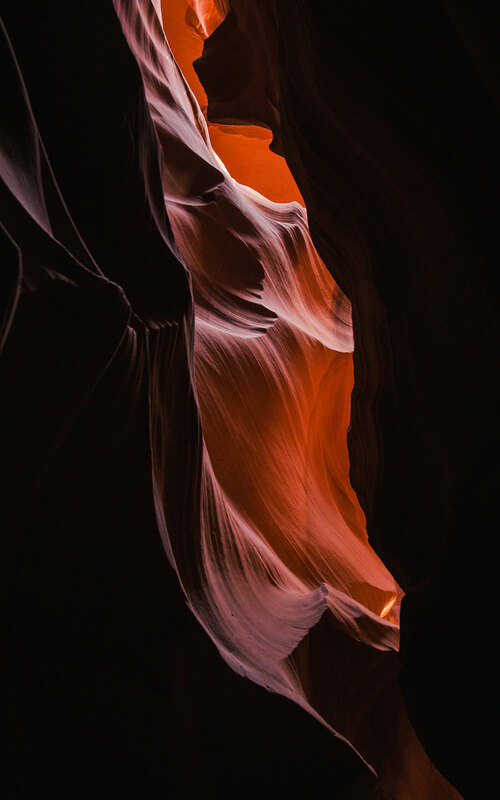 If you're gonna skip the reading (I don't blame you) and head straight down to the images, the first half of the images are from Upper Antelope Canyon and the second half (shortly after where Julie makes an appearance) are from Lower Antelope Canyon. 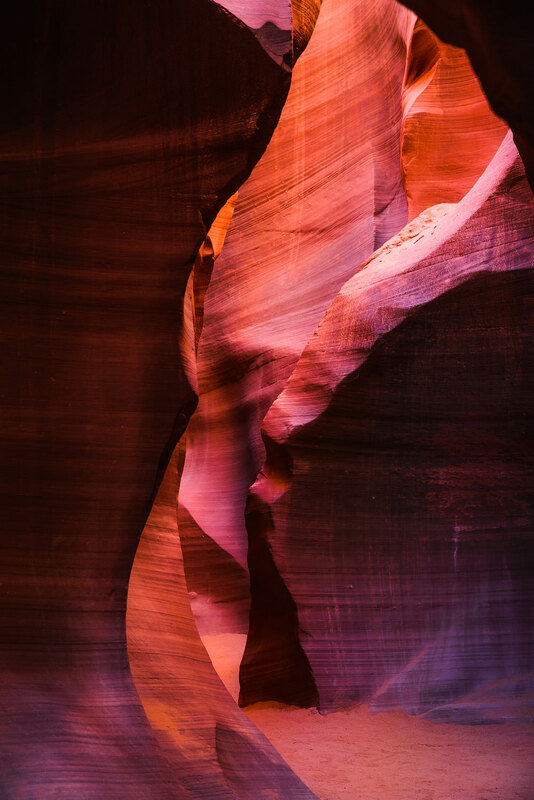 Antelope Canyon is a slot canyon located just outside of Page by the Arizona/Utah border. As far as what’s visitable, it’s broken into two distinctly different sections, Upper and Lower. The primary difference, from a topographical and photographic standpoint, is their shapes. 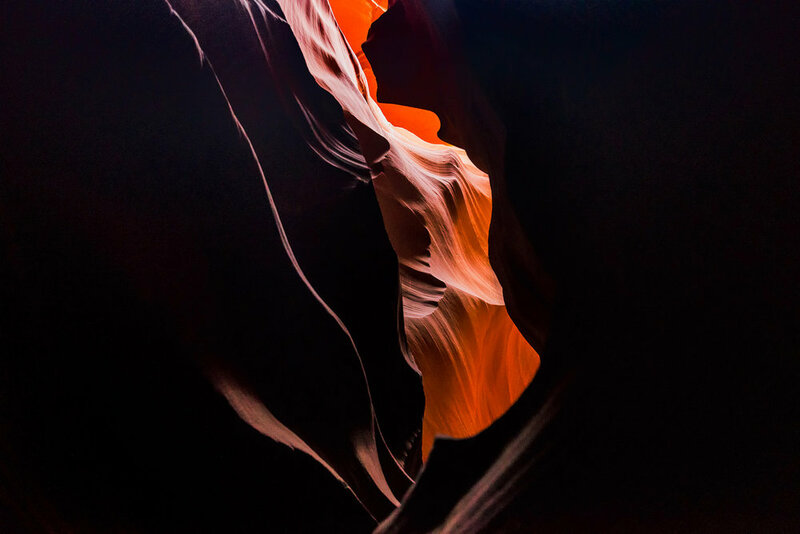 Upper Antelope is an A-shaped canyon while Lower Antelope is a V-shaped canyon. 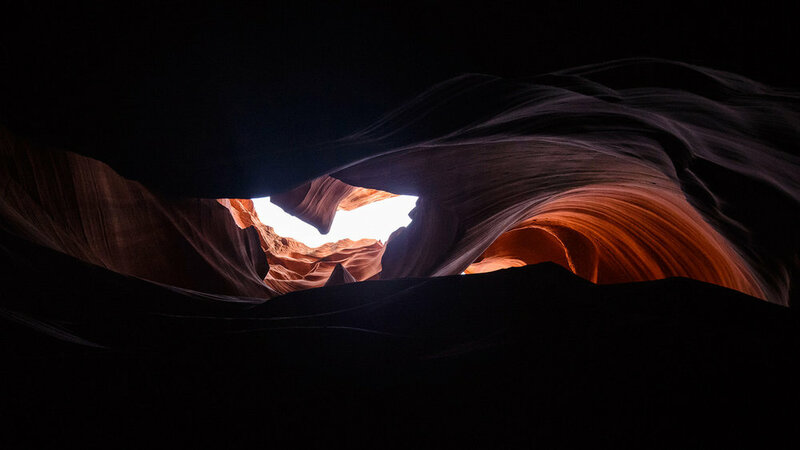 Their shapes greatly affect the way light enters and visually sculpts the canyon walls and sandstone textures. 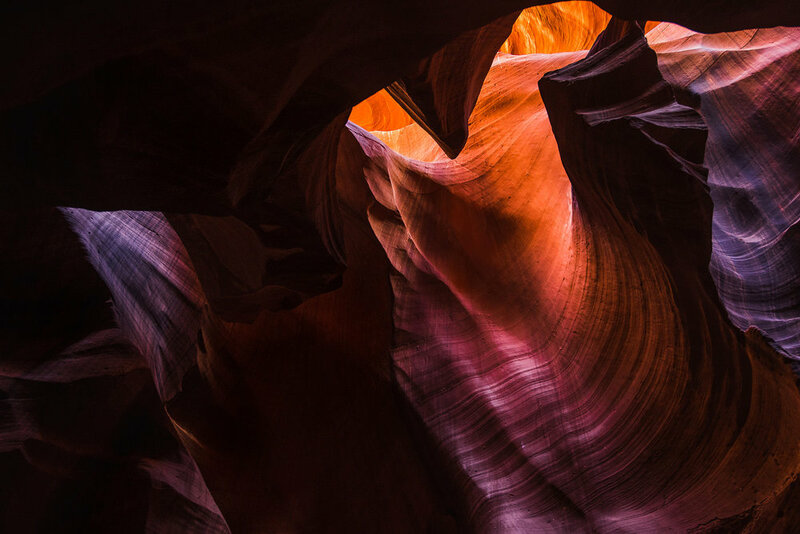 Upper Antelope Canyon is most famous for its stunning light beams created by sunlight shining through narrow passages juxtaposed with the contrast of the canyon shadows. Unfortunately timing and availability didn’t allow for an opportunity to capture the light beams, since it’s only visible mid-day when the sun is high in the sky and shining directly down into the canyon. 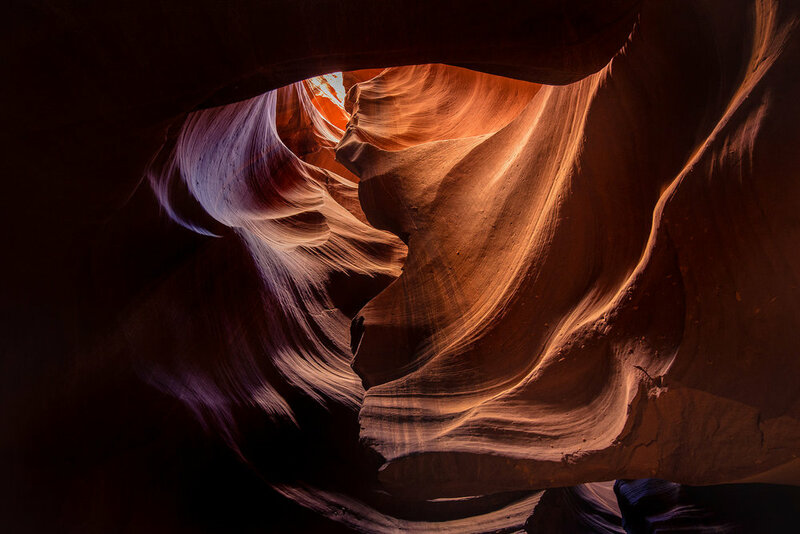 Lower Antelope on the other hand, allows for a lot more light to enter, and this light bounces off and around the sandstone walls resulting in beautiful reflected light of varying hues to paint scene. While I didn’t think photographing the canyons would be easy (especially on the standard tours), I was surprised by how challenging it ended up being. The difficulty was both artistic and technical. Shooting in low light is not foreign territory for me, however, shooting low light landscapes with no tripod (anything to support my camera/elbows for stability for that matter) and minimal time to compose and check my images certainly was. While the canyons aren’t pitch black or anything, they’re certainly dim, Upper Antelope especially. In the darker sections of Upper Antelope, I found myself struggling to balance keeping my ISO low to maximize dynamic range and detail, keeping my shutter speed fast enough to capture a sharp image, and dialing in a proper aperture to ensure my foreground and background elements were in focus. There’s not a lot of wiggle room when you’re underexposing at 1/25, f/5.6, ISO 3200. Combined with the intense dynamic range, especially in spots where the sky was visible from below, bracketing was a necessity and exposure bracketing by hand looking straight up doesn’t always work out. Lower Antelope was a lot friendlier to shoot handheld, as I was able to get solid exposures at around 1/30, f/11, ISO 800. Technical components aside, what was really difficult for me was finding a great composition with the light conditions and the pace in which we were moving through the tour. One part of my brain is listening to our tour guide to learn a thing or two and to make sure I’m moving along with the pack as instructed, while another part of my brain is working to analyze the scene and light, trying to find a composition anywhere from the ground up free of wandering tourist heads/limbs. In Upper, I wanted to get a shot that demonstrated scale and depth of canyon, but I unfortunately couldn’t do it with a composition I loved and I’m not sure how feasible it is to capture while on a standard tour. I fixated a lot of time trying to find the large scenes in Upper, realizing my mistake after the fact, but luckily had an opportunity to focus on the details on our visit through Lower. The one thing I wish I could have done differently would have been to bring a stabilized lens to Upper. I elected for a light ultra-wide (18-35mm f/3.5-4.5G) which isn’t stabilized, and while ultra-wides are generally more forgiving when it comes to slow shutter speeds, I did not anticipate needing or wanting to go to speeds below 1/10 of a second. The choice of an ultra-wide was also a bit limiting when it came to capturing details and interesting compositions. I brought the 24-120mm f/4 VR to Lower and the longer focal lengths was great for picking out and isolating the shapes and colors and the VR was awesome to have. While they’re both cool places to see, I’d be remiss if I didn’t broach the crowds and experience of visiting these two landmarks. If you didn’t know, both of these canyons lie on Navajo Nation land and are only accessible via authorized tours. 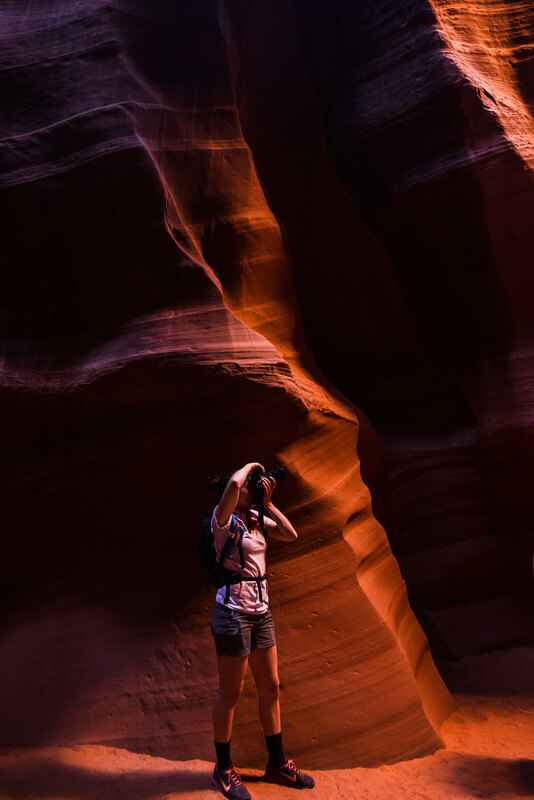 Photography tours are offered for Upper Antelope Canyon (no longer for Lower as of 2018 I believe), but they’re incredibly difficult to reserve on short notice so Julie and I elected for the standard ‘sightseers’ tour. Both tours have you in specific time slots in a group of about 15 individuals. The tour groups are decently spaced out, but even on a late Wednesday afternoon (Upper) and the first tour on a Thursday morning (Lower), it kind of felt like we were at a Disneyland standing in line to get in to spend a pre-determined amount of time in the canyon, occasionally bumping into 2-3 other groups as we made our way through the relatively small space. 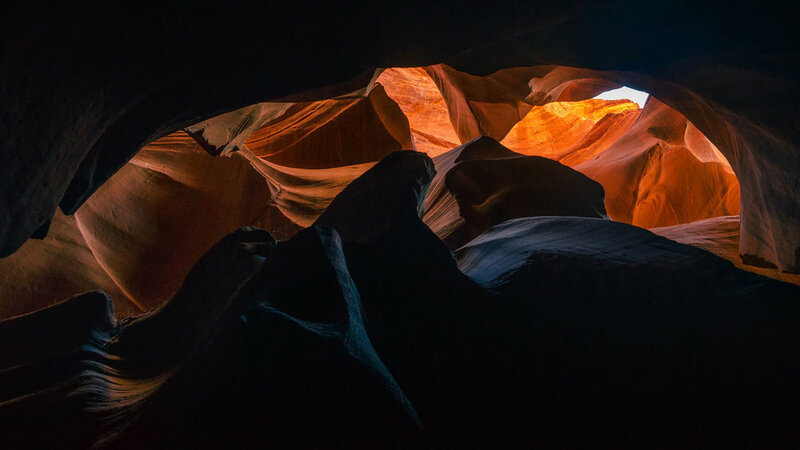 But, if you can ignore the commercialization of these two specific canyons, they are visually stunning, unique, and extremely accessible. 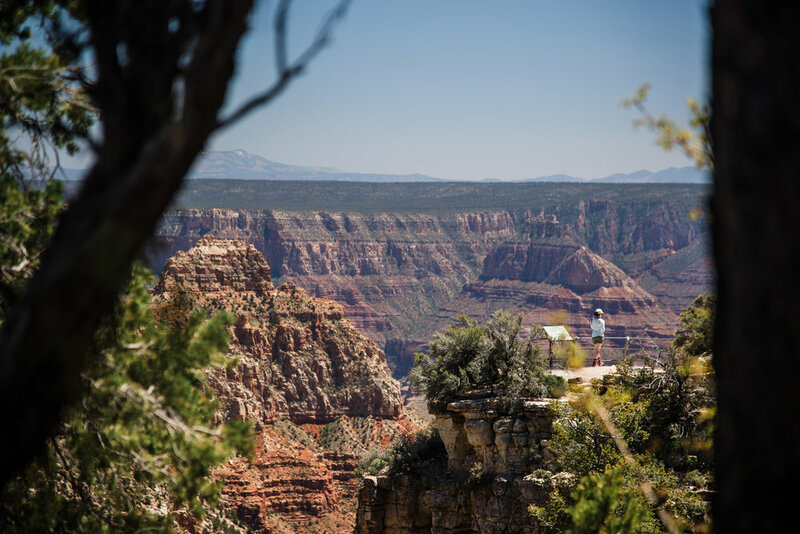 Julie and I had the privilege of photographing an awesome wedding in Arizona (which can be seen here), which was a perfect opportunity for us to road trip through northern Arizona to visit the Grand Canyon, Page area, with a quick pitstop through one of our favorite national parks, Zion. The diversity of landscapes and terrain found in the western US never ceases to amaze me. From the temperate rainforests of the Pacific Northwest, out to the crashing coastal bluffs of the entire coast, up to the continental divide of the Rocky Mountains, and down to the desert valleys of Southeastern California, 1/3 of a country offers a world's worth of visual grandeur. On this trip through northern Arizona, I was able to check off a few things on my personal landscape bucket list: the Grand Canyon (with a spectacular sunset to boot), Horseshoe Bend, and Antelope Canyon. These three locations have been photographed as much as any, but I still had a desire to be there and photograph it myself and capture it how I experienced it. They might lack a truly unique composition (especially true of Horseshoe Bend) but in these situations, it's a matter of pushing myself to create something at least slightly unique in a sea of imitations... while still getting that classic photo, of course. The Grand Canyon really is a marvel and it's not just the sheer size, but the colorful layers, intricate shapes, and unique textures that have been carved over billions of years that make it a visual spectacle. The hype is real. Hope you enjoy the photos. Photos from Antelope Canyon to follow! For my photographic gear obsessed homies, most of these were taken with my trusty ol Nikon D600 with my travel/landscape staples, the Nikon 18-35mm f/3.5-4.5G and Nikon 24-120mm f/4G VR. Also sprinkled in there are shots from a Ricoh GR and even a couple from my iPhone 6S. Pick em out if you can! The Tetons, the staggering peaks that look like the inspiration for childrens' mountain drawings, are nothing short of spectacular. 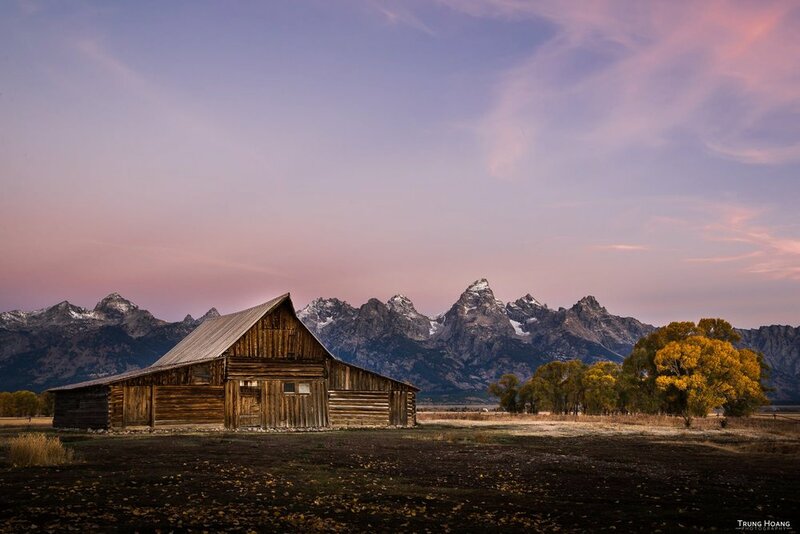 The incredible scenery, the abundance of wildlife, the lively quaint town of Jackson, WY, plus the incredible display of fall colors in September, made the area quite a sight to see. Our time was short in the Grand Teton National Park, so we had to soak in as much of the mountains, fall colors, historical landmarks, wildlife, and star studded skies as we could handle. I hope you enjoy the snow dusted mountains, moose(!! ), and autumn colors! Don't forget to stop by for prints of these images and many others over in the Print Shop!